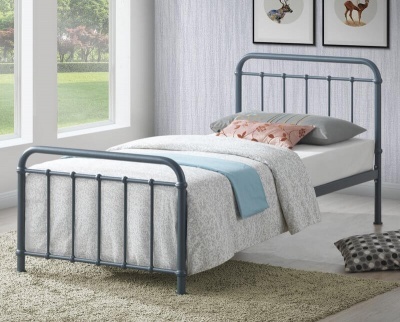 Fashionable aluminium finish works well with wooden and painted bedroom furniture. Strong and durable steel construction with an aluminium effect powder coating. Available bed frame only or with the Premier or Deluxe mattress. Premier mattress: Made in the UK. 13.5 gauge Bonnell spring unit, plastic side edge supports, 900gsm spring insulator, 270gsm polyester filing. High quality stitch quilting and a Belgium damask cover. Mattress depth - 18 cm. Deluxe mattress: Made in the UK. 13.5 gauge Bonnell spring unit, rod edge supports, 900gsm spring insulator pad, 600gsm polyester filing. High quality stitch quilting and an oyster damask ticking. Quilted boarder with air vents allowing fresh air to circulate through your mattress. Mattress depth - 23 cm. This item will be delivered using a two man delivery service, to the room of your choice. If the delivery team believe that damage to the product or premises, or injury to themselves or others, may occur whilst delivering to your chosen room they will leave the goods in a safe and convenient place. Delivered in two boxes. Plus wrapped mattress if selected.